With hundreds of variations at your fingertips, you can swiftly create the perfect needle for any project with our interchangeable Options tips and cables! The wood quality and feel is always rated top by knitting and crochet enthusiasts! KnitIQ T-pins are the perfect size for blocking your knitted, crocheted or lace projects which means your project will be held tightly in place giving you a more accurate, professional finish. 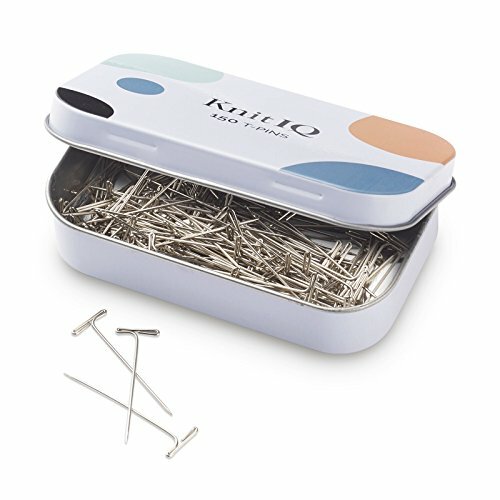 Your KnitIQ T-pins come in a handy storage tin, with hinged lid, meaning you can store them safely and always find them when you need. 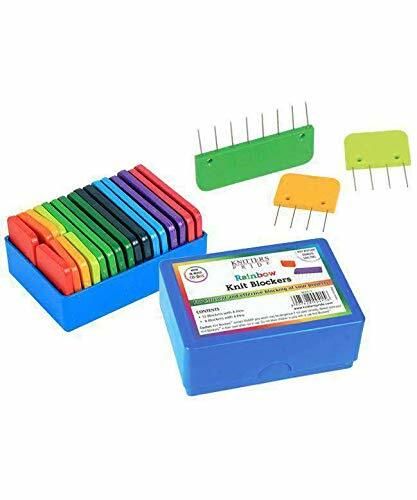 There are 150 KnitIQ T-pins in the pack so you will have enough for even your largest pieces.li> KnitIQ T-pins are constructed from stainless steel allowing you to confidently use them for wet blocking of pale-coloured items and lace without fear of leaving marks. KnitIQ T-pins are strong, sturdy and made to last, so you can use them over and over again to achieve an expert finish every time. 150 CONSISTENTLY HIGH QUALITY T-PINS. Sufficient for intricate blocking even of very large pieces. Material: Plastic locking stitch markers designed to be great practical knitting accessory. Made of solid plastic, which is flexible and smooth going through yarn, no snagging or damaging the yarn. Great for marking the beginning and ending of pattern stitches. These locking ring stitch markers are widely used in knitting, weaving, crocheting, arts, craft projects , scrapbooking, kids clothes and other DIY projects . Stitch counter clip size is approx. 0.86"x0.4" (l x w). Scarf brooch sweater small token, be a good helper when knitting. 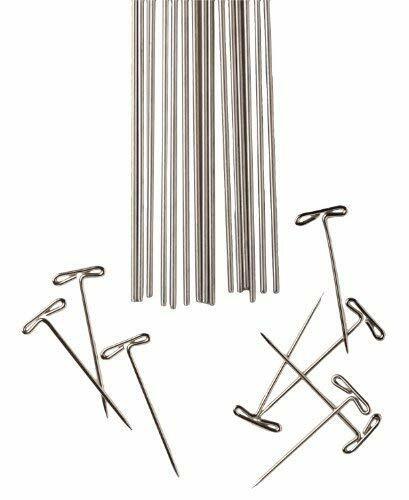 These needle tip covers work well on plastic, wooden, and metal needles. the Knitting Needles Point Protectors can avoid needles hurting you,safe for your children. 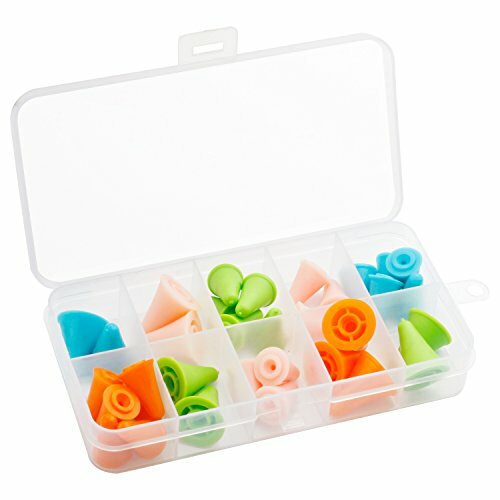 knitting needle tip caps will save you a lot of work and frustration.great gift for a beginner and enthusiast in knitting. Point Protectors Measurement : (S) approx. 1.9 x 1.2cm - 16 pcs (L) approx. 2.2 x 1.5cm 2.5cm - 12pcs Package includes: 16 pcs Small Knitting Needles Point Protectors(orange x4,green x4,light red x 4, blue x4) 12 pcs Large Knitting Needles Point Protectors(orange x4,green x4,light red x 2, blue x2) 1pcs Storage box Notice: Not suit to Circular Knitting Needles or Tunisian crochet hooks. 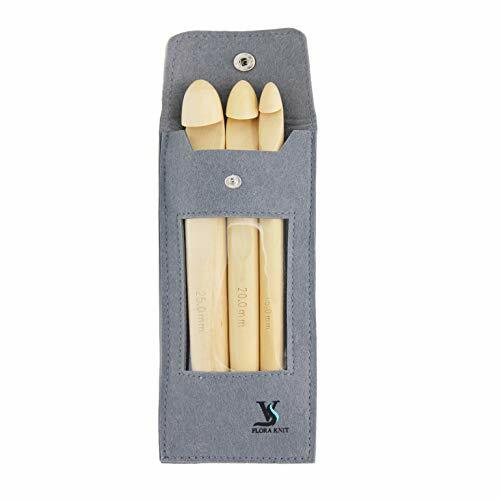 Application: Use Point Protectors to secure your stitches from slipping off the needles.Keep your knitting needle points safe and protected. You can also make your double pointed needles used as single pointed ones with these protectors. Search No More! You Have Arrived At Your Ideal Knitting Stitch Holders From LeBeila Products! Click ADD TO CART above to get your knitting stitch holders now! Limited quantities left! The bent tip tapestry needle is easier to hook under rather than the straight metal needles.,Made of steel, durable and lightweight. Imported. They come in sturdy container/tube,so they don't get lost. Great for an emergency outdoor kit for emergency repairs.Must-have for Knitters & Crocheters! Add to Cart now! Small gadgets, please keep them away from kids. Size: approx. 22 x 10 mm/ 0.86 x 0.4 inch (L x W).Come with a plastic compartment box:Box height:1.2 inches,Box diameter:4 inches/10cm. 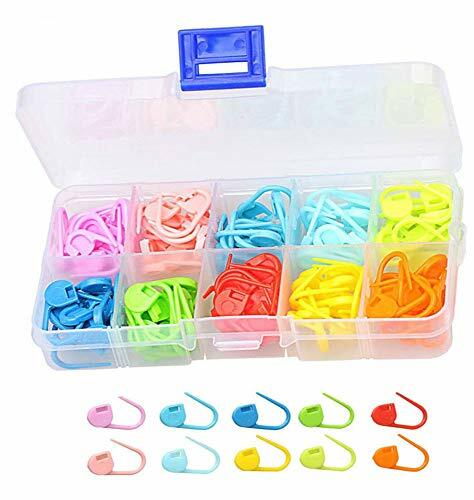 Locking Stitch Markers Set: 104 pieces plastic stitch markers in 8 colors, each color for 13 pieces, stitch counter size is approx. 22 x 10 mm/ 0.86 x 0.4 inch (L x W).Come with a plastic compartment box:Box height:1.2 inches,Box diameter:4 inches/10cm. 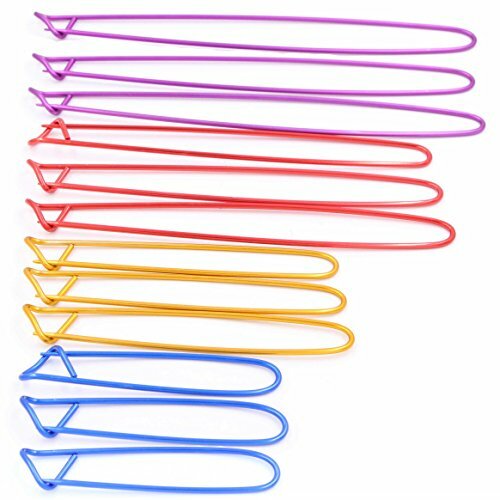 Crochet Stitch Needle Colors: stitch needle clip comes in eight bright colors of red, purple, orange, yellow, light blue, green, Fluorescent green, dark blue, choose as you like.Different colors can match your different color scarf. Practical Maker For Knitting:Mark stitches safely: good for marking beginning and ending of pattern stitches, and where to increase or decrease the number of stitches, not slip out or snag your knitting. You can use these locking ring stitch markers in knitting, weaving, crocheting, DIY arts and craft projects or scrapbooking as well. 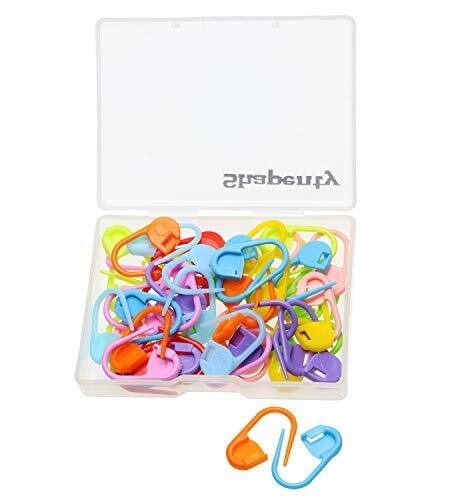 Easy to storage: these knit stitch markers come with a handy 8 compartment storage box which has a resealable fitted lid, can separate 8 colors stitch counters easily.Each color has independant compartment.You can fing it quickly. 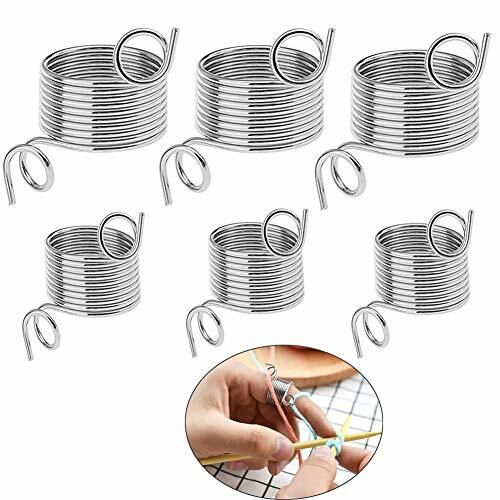 Wide application: you can use these locking ring stitch markers in knitting, weaving, crocheting, DIY arts and craft projects or scrapbooking as well.Great for marking beginning and ending of pattern stitches, and where to increase or decrease the number of stitches, not slip out or snag your knitting. NO.1Are they in good quality? YES, they are metal needles and not easy broken large eye needles for wool is much stronger than plastic darning needles. The different colors are easy to differ. The sweet hand needlepoint is blunt, which makes theses products for children safety use. NO.4 Why do you choose us? 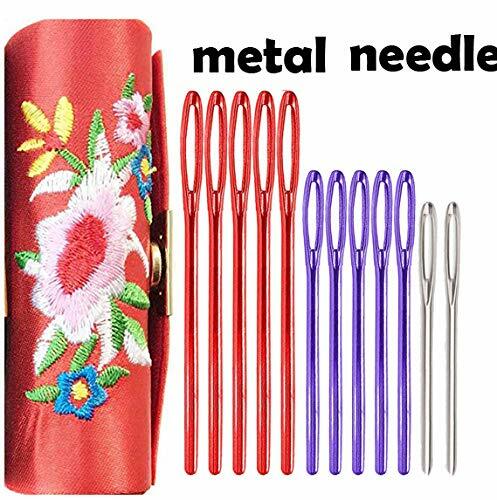 The needle come with unique case the tapestry needles set is a nice gift for Christmas,Xmas, Mother's Day or Birthday. The holes of these darning needles kids are big enough for threaders to thread thick yarns easily without getting stick. Large-eye blunt needles's blunt tip can smoothly pass through loosely-woven fabric without tearing it. Large-eye sewing needles,convenient to thread yarn through even without a threader. 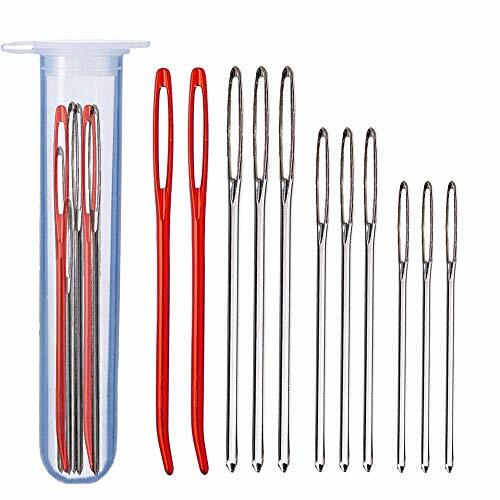 Large-eye blunt needles are suitable for most sewing works such as sweater,wool thick knitter,cross stitch,quilting,darnin,crafting,etc. Warm notice:Please keep it away from children. 100% SATISFACTION AND LIFETIME WARRANTY for the darning needles blunt collection . The pom pom might looks not so round and fluffy due to shipping environment, please understand. And you can blow by the hair dryer or shake by your hand for a few seconds, it will looks round and beautiful again. The pom pom made of imitated fox fur material, which makes it looks like the real fur, but it is a fraction of the cost and animal friendly. SIQUK are devoted to offer premium quality products to all cherished customers. 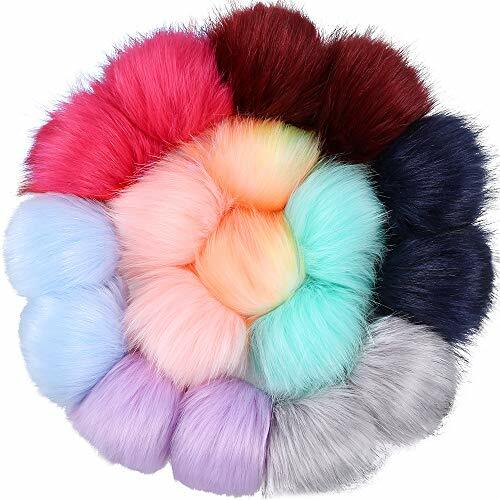 Meanwhile supply 45 days money back guarantee and 18 months warranty..
Auihiay 18pcs 4 inch high quality colorful faux fur fluffy pompom for diy creative crafts decorations. Tips: Pom Poms should be hand washed. Then put it flat in the sun to dry and use hair dryer to blow. What is more, it reduces the strain on your forefinger. This item is actually allowing you to convert said yard into a block-style coverlet at a much faster rate than you could have dreamed. Lace blocking wires are essential to creating shawls, stoles, and scarves that show off all of the delicate details of lace. Simply slip the wire through the edges of your lace project and place pins along the inside of the wires to hold them in place while the lace dries. The result is a lacey fabric that lays flat and displays the stitch patterns in detail. If you have scalloped edges you will want to slip the wire through the outer edges of your scallops to emphasize them. Follow the same rules as pin or string blocking by measuring the radius of your finished piece as you adjust the wires. Set comes with 15 (32 1/2" long) straight wires (est. 15 gauge), 20 nickel-plated T-pins and blocking instructions. All wires are stainless steel and rust proof. The first time you use your blocking wires, wipe them with a soft cloth to remove manufacturing residue. APPLICATION - Can be applied to knitting, weaving, crocheting, scrapbooking, DIY craft projects, etc. Easy to use with the help of instruction,by adults as well as children. 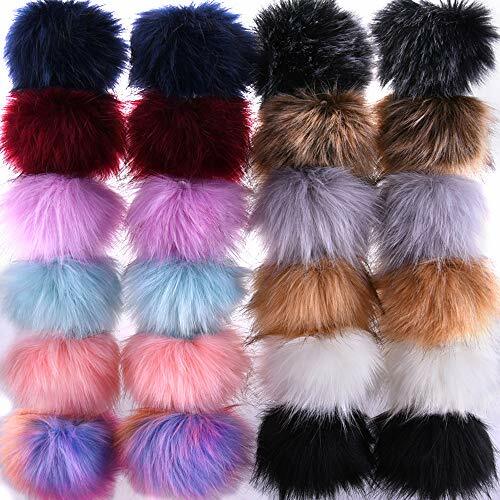 All pictures are taken in real time, you can rest assured that any pictures that you see on this page are real pictures of Handshop fuax fur pom. After you take the pom out of the package, please shake it or use a hair dryer to make it fluffed. Color: Blue, Deep green,Rose red, Purple, Pink, Colorful. Tips: Fuax fox fur pom Poms should be hand washed. Then put it flat in the sun to dry and use hair dryer to blow. 3.Practical needle point protectors:Mark stitches safely: good for marking beginning and ending of pattern stitches, and where to increase or decrease the number of stitches, not slip out or snag your knitting. 4.Knitting crochet locking have different colors, such as blue, orange, yellow, red, green, rose red and pink and so on, add more fun and color choices for your knitting work. Size: Knitting crochet locking stitch markers:(L*W) 0.87 x 0.43 inch; Stitch Ring Markers: inner diameter (from small size to large size): 0.2 inch, 0.28 inch, 0.35 inch; external diameter (from small size to large size): 0.39 inch, 0.47 inch, 0.55 inch. 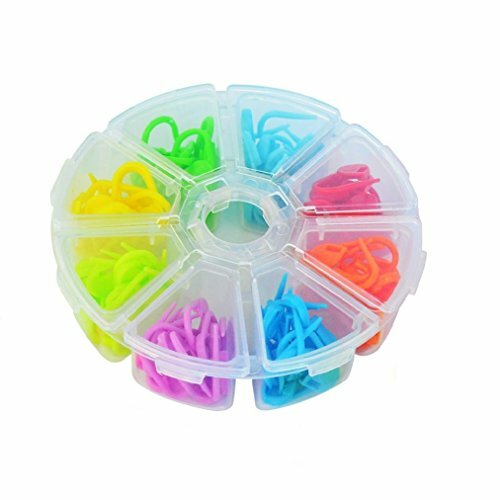 Wide application: you can use these plastic stitch holders in knitting, weaving, crocheting, DIY arts and craft projects or scrapbooking as well.Great for marking beginning and ending of pattern stitches, and where to increase or decrease the number of stitches, not slip out or snag your knitting. The stitch markers Comes with a plastic storage box with ten grids, convenient for you to put in and take out, easy to store. Each size stitch marker rings have different colors, can meet all your need for Knitting. Our stitch markers is ideal for skilled knitters and beginner. These knitting marker rings track on your patterns and easier for you to keep the patterns correct. NOTICE : Small parts, Keep Away From Children. 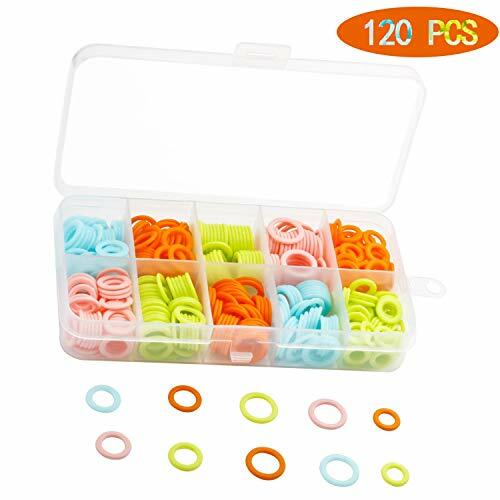 DIFFERENT SIZES & COLORS: 120 pcs stitch markers rings are made of high-grade hard plastic, sorted by 3 size and 4 bright colors. 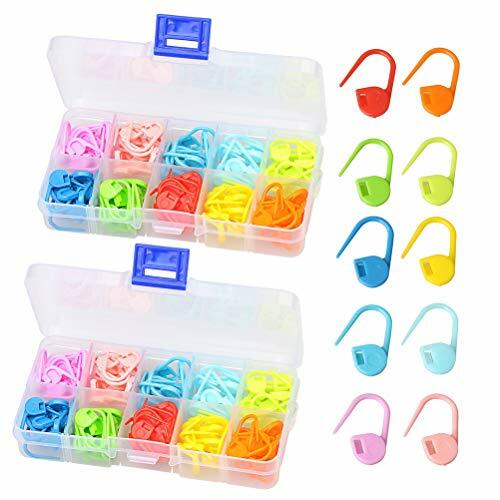 NICE & COMPACT STORAGE BOX: These knitting stitch markers come with a plastic storage box with ten grids, convenient for you to put in and take out, easy to store. GOOD SELECTION OF MARKERS: These knitting stitch markers rings are thin enough that they don't create a space between stitches, and do not distort the stitches. The stitch markers rings are not rubber, so the yarn doesn't cling to them. GREAT PLACE MARKERS: You leave the stitch markers on until you knit around to where they are, then if you don't need them as markers anymore, you slide them off. PRODUCT WARRANTY: We provide money-back guarantee. Contact us if you have any question with the Knitting Marker Rings. Warm notice: Small parts, please keep them away from children. 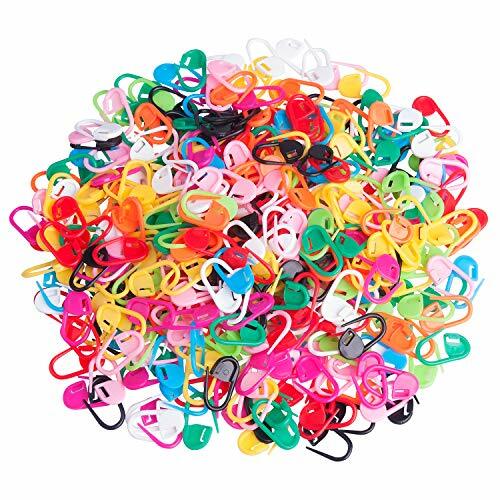 Material: Fine plastic polished plastic stitch markers. Style : Casual,Simple.Lightweight walking shoe,Convenient slip-on design,fashion and personality. 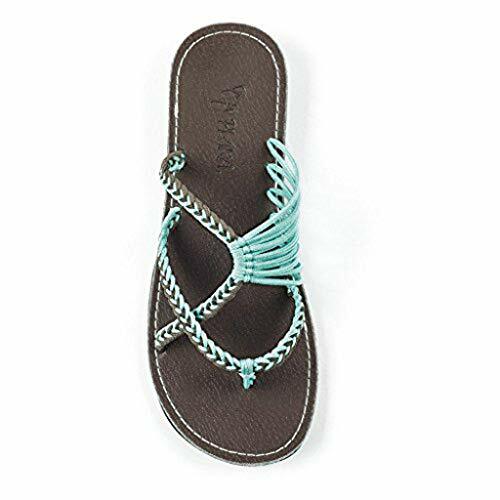 strap sandals for women embellished sandals for women comfy sandals for women cork sandals women sandals women slip on sandals for women bow sandals for women italian shoemakers sandals for women tommy sandals for women born sandals for women low wedge sandals for women closed toe sandals for women. Package :1 Pair Women Shoes(Not Including Shoebox).women ladies girls summer wedge sandals summer ladies' comfortable sandals ladies sandals shoes girls summer flat sandals summer sandal for ladies sandals for women sandals women gladiator sandals for women qupid sandals for women sandals for women keen sandals women flat sandals for women fashion sandals for women slide sandals women wedge sandals for women. Applicable Season : Spring, Summer, Autumn.Suitable for outdoor walking,Entertainment,leisure,party,work,Wedding and other occasions,color sturdy and stylish.reef sandals for women sandal for women red sandals for women low heel sandals for women beach sandals women strappy sandals for women baretraps sandals for women heeled sandals for women blowfish sandals for women flat form sandals for women spring sandals for women sandals for women fur sandals for women coach sandals for women. US Size:0-2 Bust:68-82cm/26.7-32.2" Waist:68-74cm/26.7-29.1" Hip:86-102cm/33.8-40.1"
US Size:4-6 Bust:72-86cm/28.3-33.8" Waist:72-80cm/28.3-31.5" Hip:90-106cm/35.4-41.7"
US Size:8-10 Bust:76-90cm/29.9-35.4" Waist:76-84cm/29.9-33.0" Hip:94-112cm/37.0-44.1"
US Size:12-14 Bust:80-94cm/37.0-37.0" Waist:80-88cm/31.5-34.6" Hip:98-116cm/38.5-45.6"
ASERTYOur plus sized swimsuits take all your needs into consideration. The A line silhouette and control under layer in the front help to smooth and create a flattering shape. Ample chest support is provided by the hidden foam cup shelf bra. ASERTYThe swimming dress features extra thick straps that adjust with ease. Keep your peace of mind knowing that your swim top will never leave you without proper coverage. Please refer to size detail below the product description before place order. Any questions, please kindly contact us at anytime. The set includes 50pcs locking stitch markers in a variety of colors. 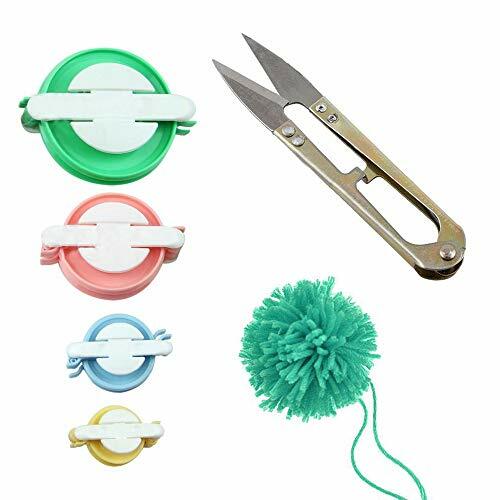 These can be used in knitting, weaving, crocheting, sewing or other crafts. Product name: Locking stitch marker. Material: Plastic; Color: 10 colors. 5pcs of each color, total is 50pcs. Designed to hook into the knitted or crocheted stitch so it will not slip out. Easy to fasten. Great for marking the beginning and ending of pattern stitches, help to count stitches or rows and keep counts right. 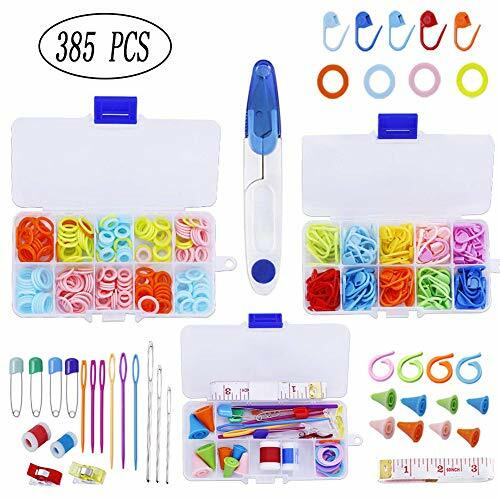 Ideal for knitting, weaving, crocheting, DIY arts and craft projects or scrapbooking as well.